So, the beta keys are out as of this posting, with the actual beta expected to start downloading very shortly. This means that some of you might be tempted to ask tech Support how to access your beta Keys. Before you do that, read this thread. 1. First off! Make sure you transferred your pledge. The easiest way to do this is make sure you're accessing the desktop version of the forums (either on an actual desktop or by requesting the desktop version of the site on your phone). If you're on the desktop version of the forums and have a badge next to your name? Your pledge has been transferred. If you pre-ordered on the preorder page before or after the Kickstarter finished? Your pledge has been transferred. If your pledge has been transferred just go to step 3 now. If your pledge is not transferred go to step 2. 2. If your pledge is not yet transferred, check your email. You should have received an email from Owlcat Games with your pledge manager Code. The title of that email is "Backer portal is now live!" and it was sent on August 25th of 2017. If you're using Gmail the instructions will look a bit hard to read due to a formatting issue, so you'll have to highlight the text. There will be a link in the email and if you follow it then you can transfer your pledge. The link should read: "https://owlcatgames.com/preorder/account?code=" followed by an alphanumeric code [delete the quotes, obviously]. 3. Once your pledge is transferred, check the badge next to your name. Does it look like mine (i.e. is it a silver ring around a green circle that says "King" when you mouse over it)? If you have a King Badge you are part of the Beta. Beta Access is only for those who pledged at the 95 dollar and above tier. if you pledged below that (i.e. if you have a golden Baron badge or a solid silver Heir Forum Badge) then you don't have access to the beta. 4. If you did pledge at a level that has access to the Beta, Congratulations! 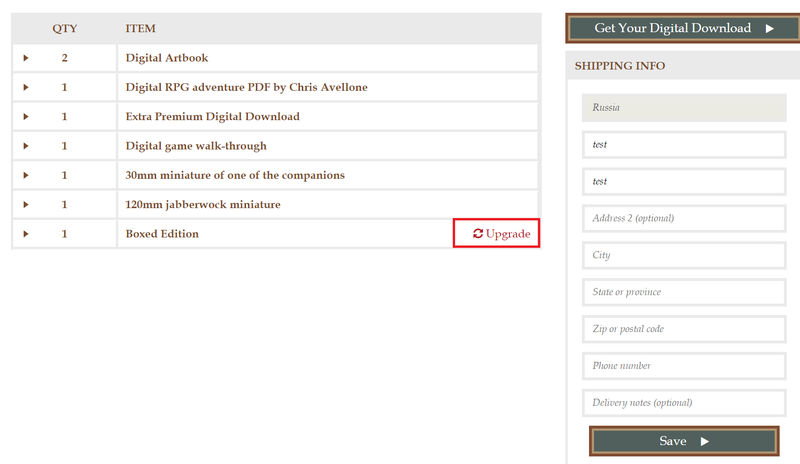 just go to https://owlcatgames.com/preorder/account and click on the link that says "Get Your Digital Download", there will be an item that says "Access To The Pathfinder: Kingmaker Beta" followed by a code. Copy that code and boot up your Steam Client (for reasons unknown to me because I do not work for Owlcat Games, the beta is Steam only, so you do in fact need a Steam client to do this). 5. Once your Steam Client is up and running click on the menubar at the top where it says "Games" Scroll down to "Activate a Product on Steam" and click that. Enter the code in the box and the beta will be added to your library. Just install it and it will download for you (once it releases) like any other steam game. 6. If you did not get a pledge manager email from the Owlcats , you can send an email to team@owlcatgames.com and they'll do their best to help you out. but be aware that they will need to generate a new pledge manager code for you so it might be a day or two until you get beta access. It's much faster to search for the email yourself if you're unsure. EDIT: It has come to my attention that some people have already transferred their pledges using Facebook accounts months ago instead of their emails and are now experiencing what I like to call "Where-the-hell-is-my-Account-itis". If you did that? Sign in via your Facebook account and your transferred pledge should show up. Last edited by Stratagemini; 04-10-2018 at 12:53 AM. For the visually impaired, like myself, there's two menu bars on steam that have "games as an option. The bigger, light blue one is not the one you want. It's the one that is at the very very top of your steam window in the left corner. Just thought I'd mention this since my eyes immediate;y went to the light blue games button and I was all "this doesn't lead to activating keys... T^T"
Hi, just want to check - is it possible to upgrade my pre-order to get an access to Beta at this point? So I bet yes it is possible. Actually some people updated they order just few days ago for Alpha test (even they were told beta is literally just a day or two away). So it is possible. "Road to the man's heart go through the chest"
Last edited by Berserkerkitten; 04-07-2018 at 12:57 PM. Yep - I upgraded my pre-order, downloaded the beta but encountered an error which prevents me from launching the game (already posted about it under technical help section). Guys, a humble request - if you need help with your pledge transfer, an email to team@owlcatgames.com is enough. And yes, it can take a (week)day or two to get a reply. It's Sunday, the lady who retrieves the pledge transfer codes is not in office today, you're gonna have to give it some time. Last edited by Berserkerkitten; 04-08-2018 at 11:56 AM. I also pledged more money beyond this pledge level amount to get some of the extras, like the hooded sweatshirt, one of the hero minis that didn't come with my pledge, etc. should that all be showing up on my account like yours is? I choose for Premium digital download (with all what it includes) that left me 10$ extra, I then choose specific Chris Avellone Pathfinder module (PDF) and had spend all my money. Now it show these 2 items in my account and I can open them and look them closer. IF I would have choose to not put that Chris Avellone module under my account I would basicly just donated 10$ for developers without asking (or getting) anything from it. So when you log in there check that you have that party banter creator (if that is a thing it show for you) and then what extra money you have choose what you wanted to get and payed for. Edit: and actually now when I think of it. IF I would not in first place choose to "do nothing" in pre-order web site I guess there would still be 50$ to use and nothing else. So I think that I had to manually choose how I wanted to use these moneys I spend in kickstart (in kickstart price naturally). But because you have your pledge I assume you have picked atleast something allready. Last edited by Pathfinder; 04-10-2018 at 06:10 AM.